Place bacon in a large, cold, non-stick pan. Turn the heat to medium and cook, stirring occasionally until browned and starting to crisp on the outside, 10–12 minutes. Reduce the heat, if needed, to prevent the bacon from burning. Add onion to the pan and season with salt, pepper and red pepper flakes. Add a small amount of olive oil, if needed, depending on how much fat was rendered from the bacon. Sauté over medium heat for 3–5 minutes, or until onions are translucent. 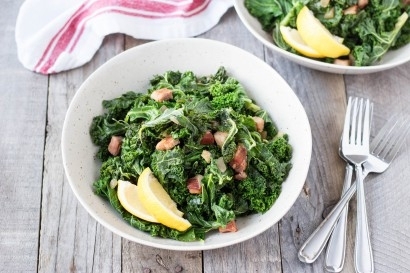 Add the kale and cook for about 6–8 minutes or until tender with a slight bite, adding a few spoons of water, as needed, to help steam the kale. Taste and adjust seasoning, if needed. Serve with lemon wedges. Enjoy.